Meet U.S. Department of State sponsored Gilman Scholarship recipient Alex Montoya. Alex was a Gilman Global Experience Correspondent during the summer of 2014 studying and interning in Shanghai, China. The Gilman Global Experience allows Gilman Scholarship recipients the opportunity to record videos around academic and cultural themes to share with other students interested in studying or interning abroad in the featured country. For more videos please visit the Gilman Scholarship’s Official YouTube page. I can’t believe I am actually in AFRICA! There is so much I want to write about and so much to tell, but mostly I wanted to tell you how grateful I am to be here! It is very surreal and I am constantly reminding myself that I’m actually in Africa! I love the people, the culture, and the hospitality. I won’t be able to express all that is going on, so please comment with specific questions and I’ll answer those. The first few days we have been going through an orientation (lots of time in the classroom and little time to explore). We learn about Senegalese customs, learn to dance a little, learn how to eat around the bowl (this means we all eat out of the same big bowl and sit on pillows on the floor), learn about Senegalese EVERYTHING! I feel like I have forgotten most of what they said, but luckily I am not afraid to ask over and over again. Out of the forty-ish students here, I am definitely the one who doesn’t mind talking with the locals. I have made friends with about everyone I have met, and they are so welcoming. The Senegalese have one word that represents their culture: TERANGA. This roughly translates to hospitality. They have a firm belief to always invite people in and help foreigners because they never know if they will need help in the future. People gladly help me with directions, finding transportation, and I have already been given so many gifts. I have had special excursions to some markets and have been introduced to several people around the city while the rest of the students just stay in the hotel. I am truly trying to get out there and experience the culture– and don’t worry mom, I’m being safe. So since there is so much to write about, I will try to give an adequate abridgment of Senegal through my eyes with the understanding that I will never fully explain the entirety of this awesome experience. 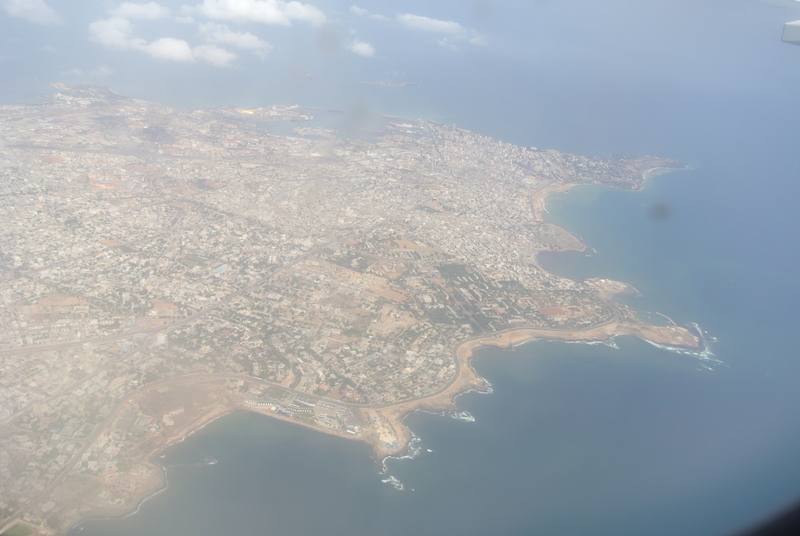 Dakar is a thriving metropolis. There are so many people, street vendors and cars everywhere. We have to cross a giant highway to get to school (which is terrifying since pedestrians have no rights) and I feel like I’m always a bit anxious when I cross. They have three main neighborhoods where students live. I live in the furthest one which is called Ouakam. Try to search for pictures from Oaukum on the internet to see where I live. This is a developing country so that means that there are livestock on the streets, dirt roads, no dependable source of running water, and frequent electricity cuts. I’m learning to shower out of a bucket and enjoy being sweaty and smelly all the time. The food is crazy delicious. Of course the main dish is rice and fish, but my host mom explained that she likes a variety of food. Everyone here eats out of one large bowl. Normally they eat with their hands, yet my family has adopted silverware after having been a host family for 6 years. Most of the dishes are very simple- lentils, french fries, rice, onions, etc. My favorite is the fruit, especially the MANGOS! They are so delicious! I eat about three a day because it also costs only one dollar for a kilo. I’m loving the food and so far no illness. So the best part so far is my host family. They insist that I call them ” Mama” and “Papa” along with my three brothers and one sister. Here are their names so you can get some sort of idea of who I’m living with: Simon Pierre, Bernadette, Christian (26), Amelie (23), Pappi (17), and Benoit (9). My little brother Benoit already loves me so much– he follows me around, copies what I do, always wants to play and gets sad every time I have to leave. 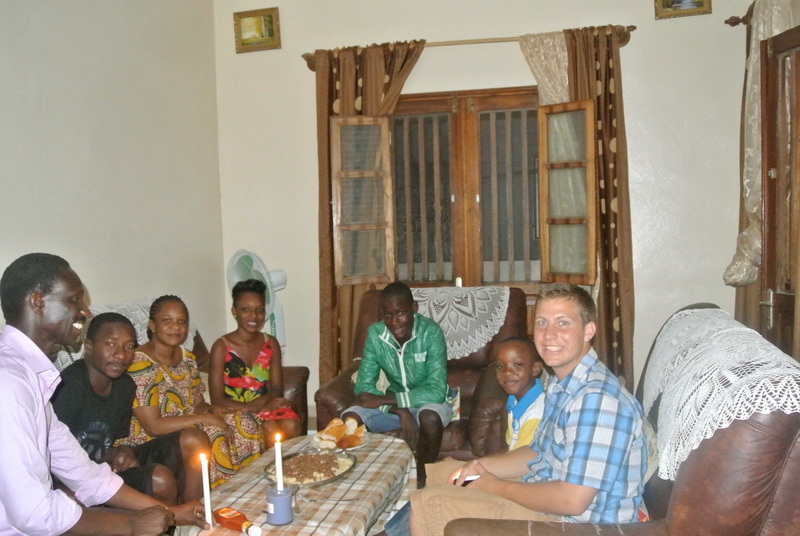 My very first night with the family almost felt like I was in the United States. We had spaghetti for dinner and after we all played UNO! I am super blessed to be living with a family that shares my beliefs and has made me feel at home so quickly. As I said, there is so much that has happened and so many people I have met! I am really missing feeling dry and smelling clean, but I know I will soon get over that. There is so much talk about EBOLA and with one case emerging in Senegal, I am trying to enjoy each day and do as much as I can. Sunset falling on the Atlas Mountains. The page remained blank. Both times. I sat there and thought, what did I really learn in Morocco? I had to have learned something! But in front of me, the naked pages revealed nothing. I didn’t worry though. I knew that what I had learned was still pouring through my consciousness, taking root deep inside my mind. I knew…but my mind and pages were blank. What did Moroccans and Islam teach me in the last five months? Where were all my deep realizations? Where was my profound understanding of the self? Perhaps, more than I can share with you right now. As I said, the lessons learned are still being processed and just because I left Morocco, doesn’t mean Morocco has left me. And so without further delay, I will share with you just a few things I learned in Morocco. Morocco is at a crossroads. I learned that Morocco is a country that is not quite African, not yet European and not fully integrated with Middle East. It is a country that has as much history as it has struggles. It is a country that is a hybrid of its past conflicts and recent conquests. Morocco has been so profoundly influenced by its past – its future is almost unreadable. Morocco is still developing. Violence and sexual harassment against women is a problem that the country has failed to address. The king of Morocco lives in abundance in any of his five palaces while thousands of homeless Moroccans endure the elements outside. Corruption, wealth accumulation and inequality are unaddressed issues that have slowly been gaining light. But Morocco is a country rich in opportunities. Its affluence doesn’t come from its GDP or its natural resources; its wealth comes from the Moroccan people – the people who wake up hoping today will be better than yesterday. Its people that have joys and pains and dreams and defeats – just like we all do. Labeling all Muslims as terrorists is as ignorant and dangerous as when Hitler blamed the entire Jewish population for being the cause of Germany’s problems. When people use religion to justify violence, for any reason, they are no longer following the principles of their own belief system. Since peace and justice are at the core of every religion that claims that God is their source of knowledge. Traveling light is a gift. 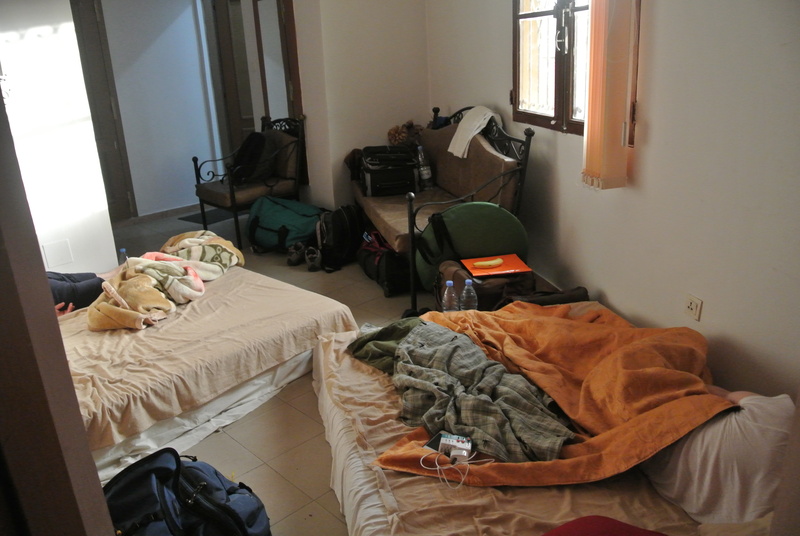 During my last few days in Morocco, I was traveling with my brother with just our backpacks and duffel bags. By no means were we traveling light, since we each carried about fifty pounds. I had given away my larger suitcase and most of my belongings to my roommate and friends. I needed to travel with what I considered the bare minimum – and it was still too much. As we traveled through Morocco, I realized how comforting it is to not have any additional weight on my shoulders. How refreshing it is to not be tied down to anything. How liberating it can be to have nothing but the clothes on my back. As we moved from city to city, we realized we should have left more behind. Very much like in life, the less baggage we carry, the more free we are to move around. It is not where you are, it is who you are with. Bus, taxi and train rides would had been much more uncomfortable had I not had a friend’s shoulder to sleep on. Hungry nights on top of Mount Toubkal would had been lonely had my soul not been filled with laughter. The stars wouldn’t have shone as brightly had I not had someone to share my dreams with. My tagine or couscous wouldn’t have been finished had I eaten alone. The cities I walked through would have been empty, had I not had someone to see them with. In my time in Morocco, I learned that it doesn’t matter where you are, it matters who you are with. You can be sleeping in a train station in Meknes, or staying in a luxurious hostel in Barcelona, or rocking on a hammock at home, and none of it would matter. The place, the location, the time – that is all arbitrary. The people we share it with is what makes the difference. But never forget the people at home. Sure, it is nice to travel to distant lands and explore new cultures, but having that little piece of home with you always makes the road seem less dangerous. Leave home, but come back to see how much you have grown. Learn about yourself so that you can teach others about themselves. Keep your loved ones close to your heart, because when the world gets cold, that is the one place where your memories will always keep you warm. I am still learning who I am. Perhaps the most insightful reflection that I have acquired is this: I am still figuring out who I am, and honestly, I might never find out – and the best part – that is okay, I have an entire lifetime to do so. Life is a journey. Our purpose? I will let the dead philosophers argue with each other over the answer. There comes a turning point, I believe, in every person’s life where we must decide: continue living the life we are living, or take a leap of faith into the unknown, venture into the realm where nothing is certain and everything is a mystery. In “The Hero with a Thousand Faces,” by Joseph Campbell, he calls it, “the hero’s call to adventure.” This is the point where the protagonist, you and I and everyone else, is faced with a challenge, with a quest they must embark on in order to attain completeness. It is a journey from childhood innocence to adulthood understanding; it is the quest from ignorant prince to enlightened Buddha; it is the merging of two worlds– the unknown and the known, the yin and yang, the light and the darkness– into one ecstatic whole. Our hero is rewarded with a deeper, more mature and holistic view of their role in the universe. Going to Morocco was my call to adventure, but as I learned in my time there, the call of duty rings more than once. At any point, life can decide to interfere and once again ask our hero if they would like to embark on a detour from the main narrative. It is during these detours that I have learned the most about myself. It is during these detours that the deepest parts of ourselves are revealed. I learned that the journey is never over. I am also learning that just because I am back home, doesn’t mean that the same Kevin has returned. And now I must wait: for Life, for Fate and Destiny to knock at my door with another quest. A new journey. The universe knows that I will answer. This quote is the most accurate way I can think of to describe my feelings for this country. During my first few weeks, I was happy to be in a new country discovering another culture, but I was by no means head over heels in love with life here. 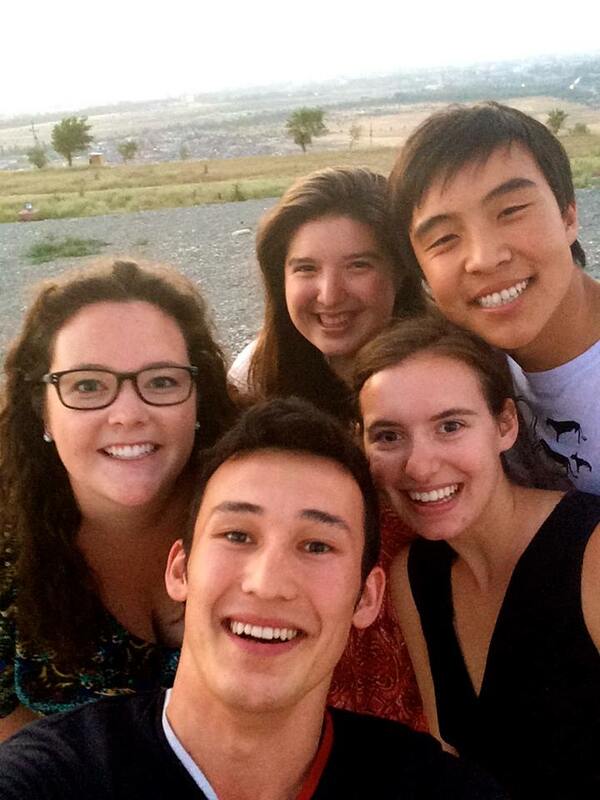 A week or so ago, as I sat with some of my American and Kyrgyz friends on top of a hill overlooking Bishkek and watched the sun go down over the city, I realized something had changed. Somehow I had fallen in love with this country without noticing it, and I had fallen hard. During my orientation at school before departing for Bishkek, we were shown a graph of the stages that people go through when they study abroad. I’m not going to lie, the graph made me pretty nervous. Although I had never traveled abroad before, I had traveled throughout the US and I go to school pretty far from home, so I’ve experienced being separated from my family and friends for long periods of time. The thing is, home-sickness was something that had never been a problem for me, so I really had no experience dealing with it. Looking at this graph and listening to a presenter tell us that we would all at some point feel depressed and helpless was definitely intimidating. It also just didn’t sound like me. I think the presenter could see the doubt on my face, because she was quick to assure me that she hadn’t thought she would feel those things either, but she had experienced every single stage on the graph. During those first few weeks in Bishkek, that graph was always in the back of my mind. I kept wondering when the frustration with the culture, the homesickness, and the helplessness would hit. Then, as I sat on that hill and looked out over the city I had come to love, I realized something. This graph wasn’t written in stone, I wasn’t obligated to feel things the same way someone else did. I’m not saying that there haven’t been times when I felt out-of-place or when I missed my friends, but, for me, these feelings never resulted in me wanting to leave or feeling extremely sad. I don’t think there is any model that can accurately predict how every single person will react to a situation and I think people experience different stages of this graph at different intensities and some may skip certain stages entirely. It doesn’t mean that some people are stronger or weaker than others; it just means we’ve all led different lives and react differently to situations. 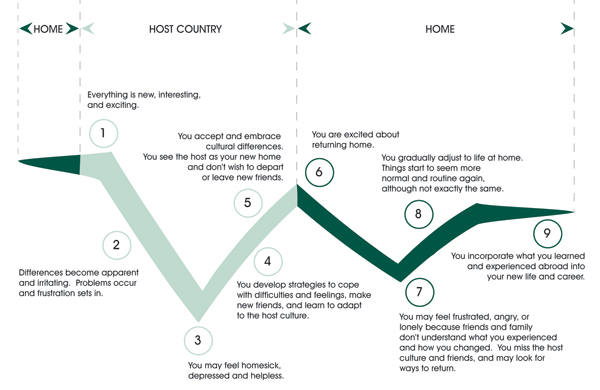 For me, I think I skipped the first stage, or “honeymoon stage” as its sometimes called, and just grew steadily more comfortable in this country until I realized that it was starting to feel like home. Perhaps, the fact that I didn’t have this period of overwhelming infatuation with Kyrgyzstan when I first got here helped me to not have a lot of negative or frustrated feelings down the road. I think what all of this comes down to, is that how we react to situations is completely up to us. I have no scientific evidence to back this up, but I’m pretty sure that every single student in the history of students who have studied abroad has had some sort of inconvenient, frustrating, or scary thing happen to them on their trip. Of course, some things have more of an effect on us than others and are harder to get over, but for the most part, how you choose to react to these things will define how you feel about your experience and determine how much you learn and get out of your trip when it’s over. It’s an empowering, but also slightly scary feeling to realize that we have so much power over our lives. I’ve gained so much from my experience in Kyrgyzstan, but I think the biggest thing so far would be this realization that I define my life and that I don’t have to fit it into anyone else’s mold, no matter how tried and true this mold is said to be. Shanghai has a way of making many foreigners feel very special. Everywhere you go people always want to take a picture with you, buy you drinks when you’re out, or attempt to snap a picture of you when you’re not looking. When I’m waiting in a metro stop or an elevator, people always want to practice and develop their English skills as well, sometimes even their Spanish! After a week, stage two of culture shock sneaks up out of nowhere. People keep asking for the same thing over and over, you start to become a bit irritated. Next thing you know, the only thing to do at this point is to blend in with everyone by popping in ear buds and walk with the beat. A few day of ignoring people as you walk around the city definitely causes a case of homesickness and stage three of culture shock hits you hard. 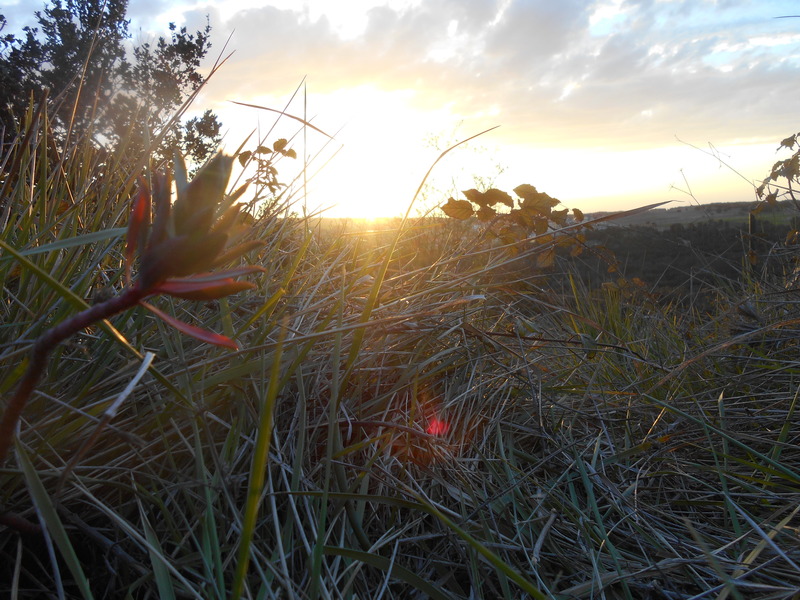 At this point I begin to remember the comforts of home and how I really needed them now. I kept questioning myself as to why can’t I navigate the metro station yet, why can’t you speak Chinese yet, and every other negative thought. Having more of a positive outlook a few days later, I found a solid group of friends that are from the US, France, Singapore, China and a few other place around the globe. We have done so many things together; without them there would be no way I would have done such crazy things. Busy days are always the best, especially with others. Culture shock becomes a thing of the past, and you finally begin to feel at home. I think the hardest part of being abroad for me is when one of your friends you have made abroad end up leaving the city for good. With mixed emotions and uncertainty of when you will see them again, this part always puts me back a step within the culture shock. As for now, I will enjoy every moment I have with them and not worry about anything else.